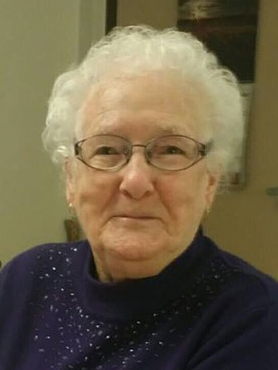 Mrs. Bern Minshull of Pierson, passed away at the Brandon Regional Health Centre on Monday, February 11, 2019 at the age of 93. She was predeceased by her parents, Frank & Birdie (Broadfoot) Morrow; husband, Bill; daughter, Betty-Anne Kirby; one brother and eight sisters. Bern is survived by her four children: Barry (Mag) of Pierson, Boyd (Linda) of Okotoks, AB., Brad (Brenda) of Pierson, and Barb (Doug) Korman of Thompson; fourteen grandchildren and twenty-nine great-grandchildren. A Funeral Service for Bern was held at the Pierson Community Hall, Pierson, MB. on Friday, February 15, 2019 at 2:00pm. (rev.) Heather Sandilands officiated with burial at the Pierson Cemetery.